On 9 April 2010, Arnfried Schmitz’s new book was published. 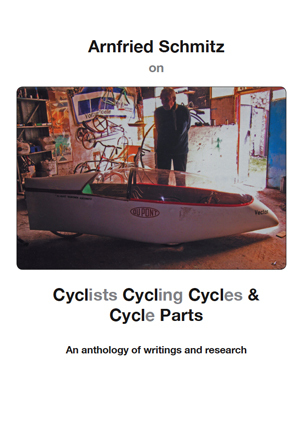 The title is Cyclists, Cycling, Cycles & Cycle Parts (CCC&C for short) and it’s a fascinating anthology of writings and research. In the popular A5 format paperback, it has 159 pages and a huge number of illustrations, many in colour. The bookshop price is £16.95. However, if you buy the book from me, the price is hugely discounted to just £11.95. Postage and packing is £1.95 for the UK, £3.95 for Europe and £5.95 for the rest of the world. Arnfried Schmitz is a man who bridges time, technology and territory. As a youngster in war-torn Germany, his first velodrome was a bomb crater, his first bike a humble roadster. Decades later, as a senior citizen, he built his own ‘garden’ velodrome, at home in the peaceful countryside of southern France. There he keeps many interesting machines, including a rare copy of the Vector HPV. Between his two starkly contrasting velodrome experiences, the world has changed amazingly, and so too has Arnfried Schmitz. As a young man, he served a three- year apprenticeship in metalworking. This put new skills into his hands and rational thinking into his mind. He then worked for a while in naval architecture, in Germany, the Netherlands and France. Along the way, he learned English, Dutch and French. Captivated by Provence, he became a French citizen, built his own house, herded goats and successfully raised a family with his charming wife Gisela. He meanwhile spent many hours collecting, riding and building bicycles (including recumbents and streamlined HPVs), researching cycling history and thinking about cycle technology. In pursuit of these interests, he became a friend to many in the world of cycling and cycle history, including Pierre Berthet, Georges Mochet and Wolfgang Gronen, to name but three. His contacts span Europe, from Russia to England. It was John Pinkerton, that great catalyst of cycle history, who introduced me to Arnfried Schmitz. Arnfried was looking for a collaborator to work on his book Human Power – the forgotten energy. At the time, I was very busy with other projects and was not particularly interested in recumbent history. But, thanks to Pinky’s persuasive powers, Arnfried and I started working together and it proved a fruitful and enjoyable collaboration for both of us. It was also the start of a great friendship. As an added bonus, recumbent history turned out to be rather interesting. This eclectic anthology of Arnfried’s writing casts fascinating light on many aspects of cycling and cycle history, from the everyday to the exotic. In reading these chapters, you will learn not only about cyclists, cycling, cycles and cycle parts, but also much about a remarkable man, my good friend Arnfried Schmitz. Still thinking, still riding, and, despite the recumbents, not a man to take life lying down.